This is awsome Jacket/Coat the flexibility and style will have you eagle tripping. It feels impressively good and the functionality, omg. With the insert you can change seasons effortlessly. Headed north no problem add your favorite teams hoodie, scarf and Scully and comfortably keep it moving. Feel good feel strong and do it with confidence. Express yourself with old-school style when you wear this Mason & Cooper leather bomber jacket. Bold red coloration provides a modern spin on a classic look. Bought a XXL Brown. Called the company to help explain the sizing. I said i wear a 52" suit jacket and he said XXL. He is right on since it is a little oversized. Soft leather and worth the money. This jack is very soft and runs true to size. My husband was very pleased with his Christmas gift. It can be worn with jeans or slacks. I've been searching for the right jacket for him for sometime and he loved this one. Beautiful leather jacket, but smaller than expected. Quality and design seemed excellent. Nice Jacket! Would like to have one, but the 4xl size is more like a 2xl. Much to small in the shoulders! Unfortunately Overstock dos not tell that this are Asian and not US. sizes!! I am very disappointed especially since I have to spend almost $*** for returning the Jacket with no fault of mine! 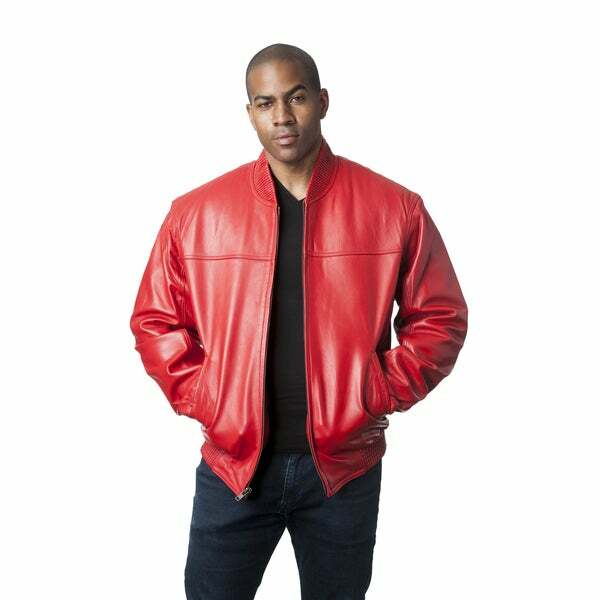 We got the black not the red, and my husband loves this jacket. would recommend, it is a well made jacket. "When are you going to get the red ones back in?" "When are you gonna get the mens mason & cooper timber bomber jacket in stock 3 or 4 xl , you had some about a month ago , me and a few friends really want that leather jacket "
"how big is 5xl? is the chest 66 To 68 inch"
Thats the not the answer i was looking for, i want to know if it will fit a 66 inch chest? "When are you gonna get the mens mason & cooper timber bomber jacket in stock , you had some about a month ago , me and a few friends really want that leather jacket"
This item is currently available for purchase.